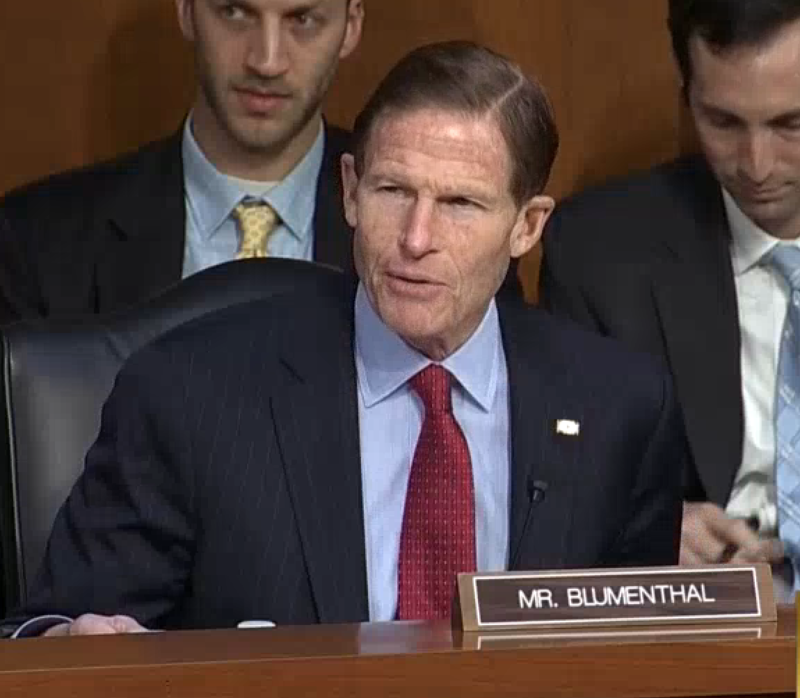 Sen. Richard Blumenthal questions Judge Neil Gorsuch during his confirmation hearing. Washington – Few Democrats on the Senate Judiciary Committee are as prepared or equipped as Connecticut Sen. Richard Blumenthal for what is expected to be a historic partisan battle this week over the nomination of Judge Brett Kavanaugh to the Supreme Court. Blumenthal, who has represented Connecticut in the Senate since 2011, has been a leader in the Democratic opposition to Kavanaugh. If confirmed, Kavanaugh is expected to move the Supreme Court to the right because he will replace retiring Justice Anthony Kennedy, who is considered a swing vote. Kavanaugh’s confirmation hearing will begin Tuesday, when members of the Senate Judiciary Committee will give their opening statements. On Wednesday and Thursday, Kavanaugh, a 53-year-old federal appeals court judge, will face questioning from these same senators, who on Friday will hear testimony from more than a dozen witnesses who both support and oppose the nominee. Blumenthal distinguished himself as one of the toughest questioners of Neil Gorsuch, Trump’s last nominee to the high court. He said he’ll be even more aggressive with Kavanaugh. 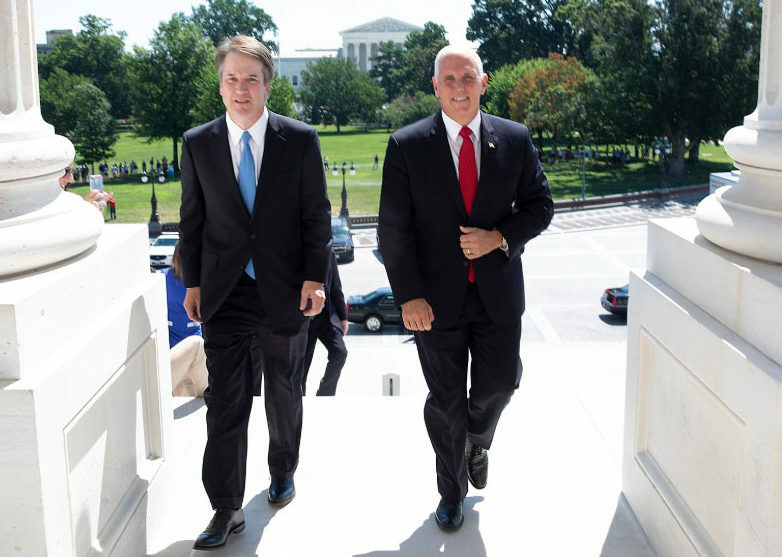 Vice President Mike Pence escorts Judge Brett Kavanaugh into the Capitol earlier this year. “The reason I’m going to be so tough is that the stakes are so high,” Blumenthal said. Kavanaugh’s supporters say he’s an excellent jurist whom the American Bar Association gave the highest score, a unanimous “well qualified” rating. A former lawyer, U.S. Attorney, and Connecticut Attorney General, Blumenthal has both a legal background and political acumen that will help him grill Kavanaugh, who has been preparing for the expected attacks from Democrats who vociferously opposed his nomination. Blumenthal’s political experience goes back decades, beginning when he took a job in the Nixon White House at the request his former faculty advisor at Harvard University, Daniel Patrick Moynihan. Blumenthal resigned and enlisted in the Marine Reserves when Moynihan announced he was leaving his White House post, and later turned down a more permanent job working for the Nixon administration – as director of the VISTA program – to pursue a law degree instead. Following graduation from Yale Law in 1973, Blumenthal first landed a clerkship with U.S. District Judge Jon O. Newman, in Connecticut, followed by an even more prestigious assignment clerking for U.S. Supreme Court Justice Harry A. Blackmun. Blumenthal said his experience as a clerk will be an asset in questioning Kavanaugh. Blumenthal said Blackmun was on the court for decades after he clerked for the justice in the 1970s. “He grew in his perspective because he was not an ideologue,” Blumenthal said of Blackmun. But Blumenthal and other Democrats who oppose Kavanaugh believe the nominee is a dyed-in-the wool ideologue. Blumenthal said his many years as a litigator also prepare his for his role this week in the confirmation process. It is also important to note that Blumenthal has argued four cases in front of the U.S. Supreme Court. In press conferences, television appearances, tweets and press releases, Blumenthal has hammered home Democratic concerns about Kavanaugh – that he would overturn Roe v. Wade, end the rights of states like Connecticut to pass tough gun laws, and protect Trump from possible prosecution. He has also been on the front lines of Democratic attempts to seek hundreds of thousands of pages of documents from Kavanaugh’s tenure at the White House. Kavanaugh worked in the legal office of the George W. Bush White House for two years, and as the president’s staff secretary for two years. Republicans on the committee have only asked for records from Kavanaugh’s time in the legal office and allowed a legal team headed by William Burck, a former Bush aide, to redact records and determine which ones would be released. Blumenthal made that statement shortly before the Trump administration, citing executive privilege, announced it is withholding more than 100,000 pages of records from Kavanaugh’s time working for Bush. Blumenthal led Democratic senators in filing a Freedom of Information Act request for Kavanaugh’s records and is preparing to sue if needed to obtain them. He cautioned senators who plan to vote to confirm Kavanaugh there could damaging information there. The confirmation hearing itself is largely pro forma. Most senators know how they will vote before the proceedings ever begin. Blumenthal and fellow Connecticut Sen. Chris Murphy were among the first to announce their opposition to Kavanaugh’s candidacy when Trump named him in it early July. With a slim 11 to 10 GOP majority on the panel, the nomination is expected to be approved by the Senate Judiciary Committee. Kavanaugh is also expected to be confirmed by the full Senate, where Republicans hold 50 seats, compared to Democrats’ 49. Three Democrats said they will make up their mind about Kavanaugh after the confirmation hearing. They are Sens. Heidi Heitkamp of North Dakota, Joe Manchin of West Virginia and Joe Donnelly of Indiana, all of whom voted to confirm Gorsuch and are running for re-election this year in states Trump carried in 2016. “We have an uphill fight, no question,” Blumenthal said. But he said the hearings could help persuade colleagues on both sides of the aisle that Kavanaugh should not sit on the nation’s highest court. Blumenthal said he plans to ask Kavanaugh about his views on the constitutionality of the Affordable Care Act. The controversial health care law is under legal challenge in a case in Texas that could go to the Supreme Court. Blumenthal also said he’d press Kavanaugh about his position on Roe v. Wade, a landmark 1973 Supreme Court case that ruled unduly restrictive state regulation of abortion is unconstitutional. It’s unlikely that Kavanaugh will offer meaningful responses. In fact, he’s expected to adopt what has been called “the Ginsburg rule,” the practice of a Supreme Court nominee dodging a tricky question. It is named after Justice Ruth Bader Ginsburg, who said during her hearing in 1993 that it would be improper for her to disclose how she might rule in cases that came before her. Blumenthal will also join Democrats questioning Kavanaugh about what has become an even more important issue for the party since Trump’s former campaign chairman Paul Manafort was convicted of tax and bank fraud charges, and the president’s former personal attorney, Michael Cohen, pleaded guilty to charges of tax fraud and campaign finance violations on the same day. Blumenthal said Trump’s potential legal troubles are the “elephant in the room.” Democrats will question Kavanaugh about his views on executive privilege –specifically if he believes Trump could be subpoenaed or even indicted while in office, or if the president can fire special counsel Robert Mueller and order the Russia investigation closed. Kavanaugh is an advocate of the “unitary executive’” model of government, in which the president wields more power. In 2009, he wrote that presidents should be immune from criminal investigations and prosecutions, as well as personal civil suits, until after leaving office. He has also suggested that the Supreme Court decision upholding the subpoena issued to President Nixon during the Watergate investigation was wrongly decided. “Never before has a sitting president been named an unindicted co-conspirator,” Blumenthal said. To help them press the issue, Democrats have invited John Dean, who served as White House counsel during the Nixon presidency, to testify in opposition to Kavanaugh. Dean is known for his cooperation with prosecutors during the Watergate investigation and is expected to testify about abuses of presidential power. Republican witnesses supporting Kavanaugh include two former solicitors general, Paul C. Clement and Theodore Olson. In an election year, the fight over Kavanaugh’s nomination has provided plenty of fodder for both Democrats and Republicans to raise campaign cash and shore up their support among their bases. But to liberals like Blumenthal, the fight is also personal, since they believe so much of the progressive agenda is at stake.